In honor of Mother's day, today, I'll discuss the family of Isaac and Sarah. Isaac and Sarah married in 1884, as mentioned before. They had 9 children, 5 boys and 4 girls, between 1885 and 1900. 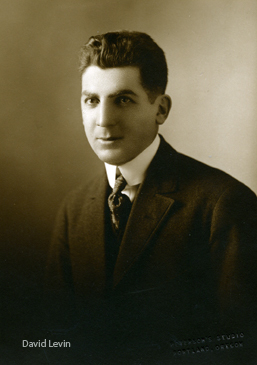 David Levin was the oldest son, born in 1885 in Minneapolis, Minnesota. According to the 1910 census, he married about 1908 and was living in Minneapolis with his wife Hildegard and daughter Rosalie. I have some question regarding whether this is the same David Levin, since the last name on the census is spelled LeVine. However, other details certainly are consistent. I have not found later Census records for David. I did find a draft registration card for WW II, for a David Levine, living in Portland Oregon. This record has a matching birth date and location, but does not list his wife as contact. 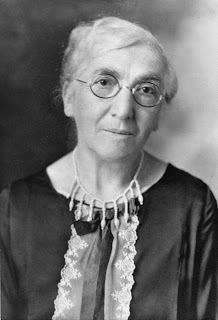 Instead it lists a Lillian S. Levine as the contact. I don't have any additional information on David. Etta Levin Straus was the oldest daughter, born in May, 1886, according to census records. I could not locate a birth record for her in either Minneapolis or St. Paul. In 1907, she married Louis Straus and had their first daughter, Evelyn, two years later. Myron was born in 1912, and Dorothy in 1913. By this time, they had moved to Ashley, South Dakota, where they had a store. Later they moved to Kansas City where Etta died in 1973. I was fortunate to have been in correspondence with Evelyn not long before she died in 1994. She was a wealth of information and sent me many of the pictures I'm posting here. 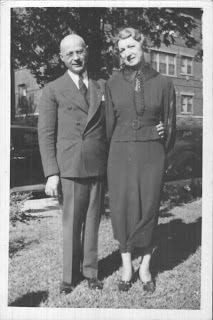 The picture is of Etta and her husband Louis from around 1937. 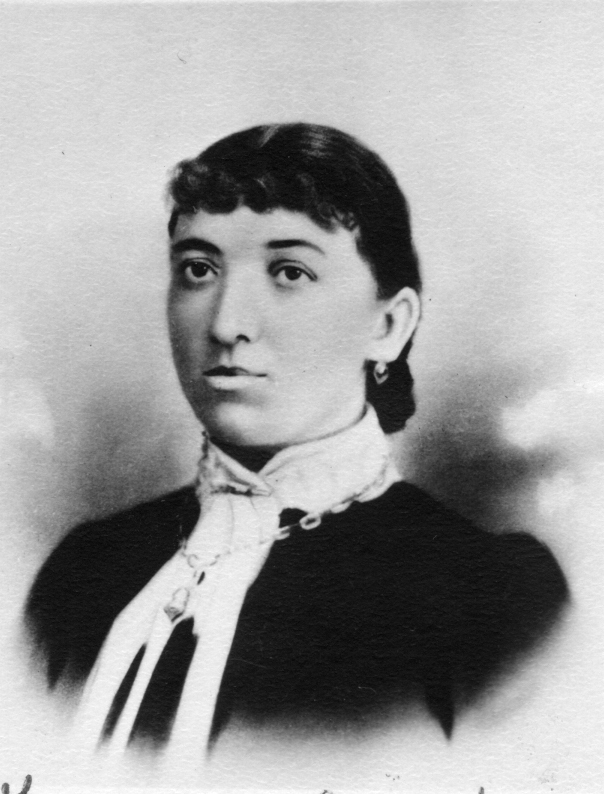 Isaac Levin married Sarah Michalowitz in Minneapolis, Minnesota on April 14, 1884. They appear to have initially settled in Minneapolis, where their first son was born the following year, but moved quite a bit between Minneapolis, St. Paul and Princeton, until Sarah returned to Minneapolis in 1902. Sarah was the daughter of Boruch (Benjamen) Michalowitz and Dora (Michalowitz?). She had one sister, Ida Gittel, who married Jacob Aronsohn. Jacob later became a well known Rabbi in St. Paul. I’ll discuss the Michalowitz family more in later posts. There is some interesting indirect evidence that suggest that Sarah was born in Mariampole, Lithuania. In 2000, Gladys Spratt, a descendent of Sarah’s sister Ida Gittel, published a history of the Aronsohn family, “Set in Amber”. This history states that Jacob and Ida were born in Mariampol, from where they emigrated in 1886, settling in St. Paul. It would not be unreasonable to assume that Sarah was born in the same place as her sister! The 1905 Minnesota state census shows Sarah living with her children on Emerson St. in Minneapolis. However, the notes show that three, Nathan, Moses and Leo, were at an orphanage in Ohio. This was no doubt the Cleveland Jewish Orphan Asylum, now known as Bellfaire, in Cleveland, although I’ve never contacted them to see if they have any records. This record shows that David, the oldest son, was in the Navy, and that the oldest daughters, Eva and Etta, were working as clerks, and no doubt supporting the family. It must have been a very difficult life as a widow with so many children, especially having to temporarily give up three of them! The 1920 census shows Sarah living in Ashley, SD with her son Moses (listed as Morris in the census). They lived a few doors away from her daughter Etta, who had married Louis Strauss. The 1930 Census shows her living in Kansas City, in the home of another daughter, Fanny. She died a year later and was buried in Sheffield Cemetary, Kansas City Missouri. Evelyn Dale, a granddaughter, remembered Sarah when I spoke to her in 1988. She recalled that she was very Orthodox, kept a kosher home, and was diabetic. Evidently, she also did not get along with her sister by this time. “Family differences.” “Something was wrong there.” Evelyn did not ask for details. The first evidence of his new life in the US is his marriage license and an entry in the Minneapolis city directory for a Isaac Levin, peddler, in 1885/6. Over the next 19 years, until his death in 1904, he lived in a variety of places in Minneapolis, St. Paul (1886-8, according to city directories) and Princeton, MN, where he lived with his family and father in 1900, as recorded in the 1900 census. Although I have not found any death record for him (having searched in a number of Minnesota counties from Mille Lacs to Ramsey and Hennepin), I found his grave in the Minneapolis Jewish Cemetary outside Minneapolis. The 1885 Minnesota State Census shows him living in Minneapolis with his wife, son David and father in law. The 1895 census shows him living in Princeton, MN with his family and father. Interestingly, the Minneapolis city directories for 1902-04 list a Mrs. Sarah Levin living there, at the same address as an Eva Levin. In 1905, the listing changes to Sarah Levin (widow). No doubt these are Isaac’s wife and daughter. There are no records regarding where Isaac was in this time. Court records show that Isaac and Sarah Michalowitz, his wife, were married on April 14, 1884 in Minneapolis. They had their first child (of eight) the following year. Isaac Levin, oldest child of Harry Levin and Rachael Frank. Isaac is my great great grandfather. Was born most likely in Lithuania in August, 1861 according to 1900 US Federal Census data. The Minnesota 1895 census says he came to the US 14 years earlier, and had lived in the village of Princeton, MN, for the past 6 years, one month. The 1900 US census also shows him living with his family and father in Princeton, MN. By this time, his family had grown to 8 children, including my grandfather Nathan. This census lists the occupation of both Isaac and his father Henry as "notions peddler". This no doubt meant that they carried a bag of notions - thread, needles, buttons, zippers and such, from farm to farm in the surrounding area. Whether they did this by foot or on horse, I don't know, but since much evidence says the family was very poor, I suspect they went by foot. Evidently peddlers were actually useful members of rural communities back then, since they not only brought useful goods to isolated farmhouses, they also brought news and gossip from farm to farm. Isaac probably came to the US in 1882. This is the year that pogroms started in the Pale in Russia, and the start of the migration of eastern european Jews to North America. Unfortunately, I have never found any records of his immigration. I even searched several years of NYC passenger list to no avial. Remember that this was before Ellis Island, so the records are not as easy to work with. More likely, he came through a different port. Some have speculated about Montreal, for example. He probably settled in Minneapolis or St. Paul upon arrival. David Levin's draft card show states that he was born in Minneapolis in 1885. He's the oldest child. The 1887-88 St. Paul city directory lists an Isaac Levin living at the same address as a Joseph Michalowitz. Since his wife Sarah was a Michalowitz, this is probably the same person. He probably moved to Princeton, MN the following year, since his son Nathan (my ggf) was born in Princeton in 1890. What we do know is that various census and naturalization records all suggest that the entire extended family of Isaac, that is all his brothers, sisters except Mina, and father all came to the US by the mid 1880s, so they were among the first Jews to flee the pogroms. Why were they among the first to leave, leaving a full generation before many of their brethren? I have no idea, but have puzzled over it for year. Harry Tuchman Levin, a rather famous cousin of my grandfather Nathan, professor of literature at Harvard for many years, told me when I met with him in the 1980s that his uncles talked about estate management and travel. He said his uncle Ben talked about traveling to Alexandria, Egypt when he was younger - certainly not a trip taken by your typical pale resident? Harry T. Levin also told me family lore about the family name being changed from Rosenholtz (a Jewish "flower" name, he said). This was to avoid the Czar's draft. After spending a lot of work on this, including contacting some elderly Rosenholtz folks in Minneapolis, I've concluded that it is probably not true. 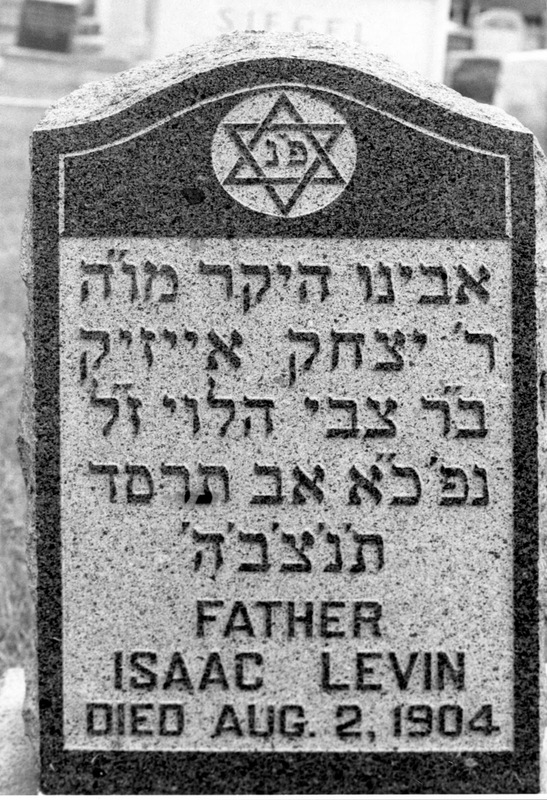 My best evidence is the gravestone inscription of my great grandfather Isaac, who is buried in the Minneapolis Jewish Cemetary in Richfield, MN. Translated, his stone not only confirms his father's name as Tsvi in hebrew, it says "of the Levites" so I'm told. I'm more inclined to trust the memory of folks back in 1904 than the memory of people 80+ years later! We know little about Rachael Frank, wife of Harry Levin (1833) and mother to many children. Even her name and place of birth is uncertain, due to conflicting evidence, but most evidence points to Lithuania. Of the death records for six of her children, one lists Russia, one Germany, the rest list Lithuania as her place of birth. Most give her first name as Rachael, but one lists Rose and one lists Neohma. Looking further at census records, we don't find her in any US censuses, so there is no evidence that she came to the US. My guess is that she stayed behind with her daughter Minna, who never emigrated. The census records of her children from 1900-1930 list her place of birth as Russia, Poland, Lithuania and Germany, and her language as Hebrew, Yiddish and German. The son who claimed she came from Germany and spoke German in censuses also had Germany listed in the death record. There is some evidence that this claim was an effort at assimilation, not an uncommon practice during this time period. Will we ever learn more about Rachael? Given the opening of archives in Lithuania the past decade, it is possible. However, records were not well kept in the 1880s and 1890s in that area, so who knows? 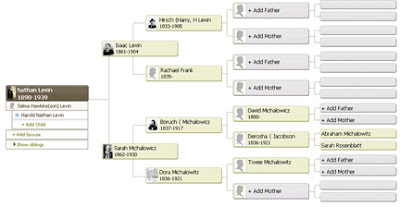 The patriarch of the family according to my work is Harry (Hirsch) Levin. What little I know about him I gained from census records. In the 1900 US census, he's listed with his son Isaac (my great grandfather), in Princeton MN. His occupation was listed as a notions peddler, the same as Isaac. The census says he was born in July, 1833 in Russia. 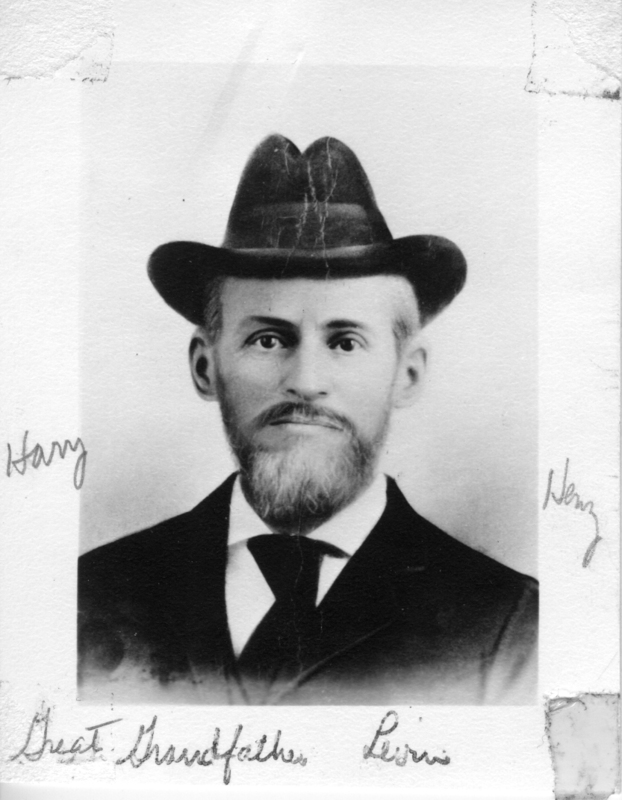 He was also listed in the Minnesota State census of 1895, living with Isaac. This census says he lived in the state for 14 years, and in Princeton for 6 years one month. Since the census was in June, he and Isaac must have moved to Princeton in May, 1889, probably from Minneapolis St. Paul. Harry had 8 children. Isaac was the oldest. One, Minne or Mina, stayed behind and was lost during WW II. The rest emigrated from Kovno district, Lithuania, according to most evidence. I have never located any death record for Harry, even after calling a number of counties in Minnesota. Since he did not appear after the 1900 census, it is most likely that he died sometime between 1900 and 1905. Some years back, Evelyn Dale, a cousin of my father, sent me his picture. Although there is no date on it, I suspect it was taken in the 1880s. 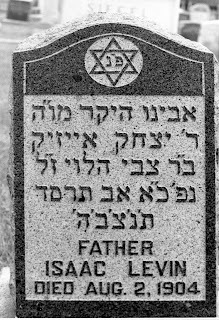 This blog is dedicated to the Levin ancestors of my father, Harold Levin, who was born in 1920 and died in 1979. Like many of his generation, he did not talk much about his background, or maybe I was not listening? Because he moved away from his ancestral home of Minnesota during WWII and never returned, I grew up knowing little about his background. In the mid 1980s, I moved to Minneapolis, my father's birth place. This was my chance to learn more about his background. So the story really begins there. 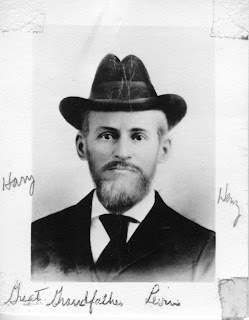 Harold's mother Selma, before she died in 1975, left some notes regarding the family history for both her parents and the parents of Harold's father Nathan. This is where the story begins. Harold Levin was born July 5, 1920, in Minneapolis, MN. His parents were Nathan Levin and Selma Hawkins. 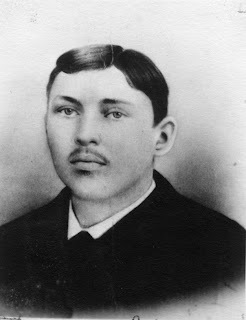 Nathan was born in 1890 to Isaac Levin and Sarah Michalowicz, and was the fourth of 9 children. Nathan died in 1939 in Minneapolis. A short family tree is below.